I've never been one to return a rental car in mint condition. In County Sligo, I accompanied Beth & Deirdre across the tidal channel linking Coney Island with the Irish mainland. Driving was somewhat exciting, especially when crossing puddles of unknown depth. 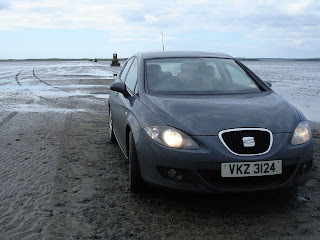 We succeeded in finding a geocache on the island, and got the car back before the tide came in.